This Situation Update describes events occurring in Kawkareik Township and Kyainseikgyi Township, Dooplaya District during the period between June and July 2017, including health, military activities, education, refugee repatriation, and development projects. Military activities in Dooplaya District in the period in the months before July 2017 increased because allied Tatmadaw and Border Guard Force (BGF) patrolled on civilian roads and villagers’ plantations. In July 2017, Tatmadaw Battalion #313, led by General Win Htun and Myo Thu, based in Kawkareik Township, Dooplaya District, illegally collected U--- villagers’ durians from their plantations. 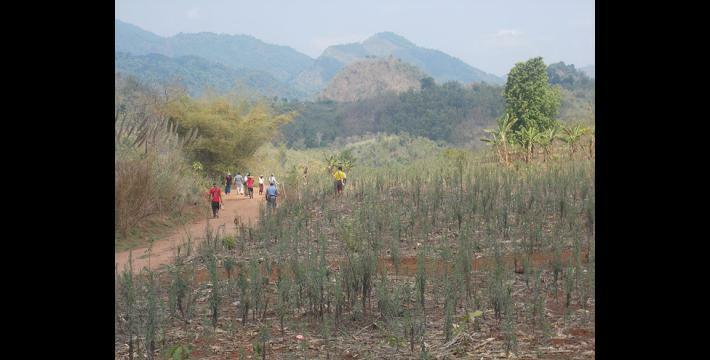 When the U--- village head reported this issue to General Win Htun and Myo Thu, their soldiers entered into the villagers’ plantations with guns and knives, and collected villagers’ durians again. 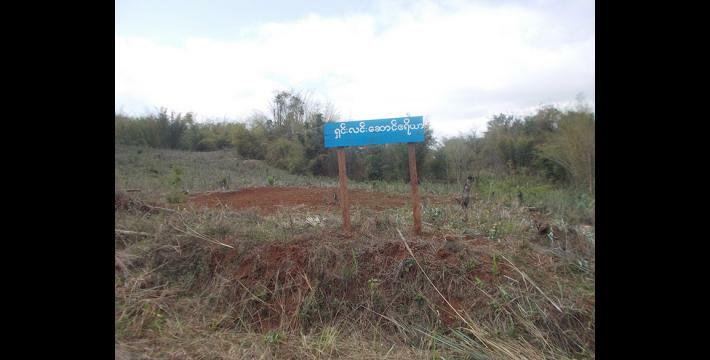 Tatmadaw Light Infantry Battalion (LIB) #283, under the control of Major Aung Shway Oo and Camp Commander Mya Lay, enlarged their army camp in Kyainseikgyi Township and intruded on villagers’ land. The number of Noh Poe refugee households that applied for repatriation increased because they received information that humanitarian aid for refugees who stay in camp will be cut in 2019. Since they cannot live in the camp without aid, and they also cannot resettle to a third country, they said they had no choice but to apply for repatriation. Currently, in Htee Nya Paw repatriation area, there are no houses, hospitals, schools, or roads built, so refugees who visited the area were concerned and therefore request that stakeholders who monitor the repatriation process ensure that the area is well prepared for refugees to return in the future. The following Situation Update was received by KHRG in August 2017. It was written by a community member in Dooplaya District who has been trained by KHRG to monitor human rights conditions. It is presented below translated exactly as originally written, save for minor edits for clarity and security. This situation update describes events occurring in Dooplaya District during the period between June and July 2017, including health, military activities, education, refugee repatriation and development projects. Between June and July 2017, the health situation in Dooplaya District improved. Health worker teams [CBOs/CSOs from Karen National Union [KNU] and Burma/Myanmar government] regularly provided healthcare awareness trainings and healthcare services to communities. Some villagers from Aww Hpa, Noh Neh, Kya K’Wa, Aww Ler and K’Toe Hta villages contracted malaria and flu. Since healthcare services in the community were active, no flu or malaria patients died from their sickness. Between May 1st 2017 and July 10th 2017, military activity in Noh T’Kaw [Kyainseikgyi] and Kaw T’Ree [Kawkareik] Townships increased from previous months. The allied Tatmadaw and Border Guard Force [BGF] often travelled along the National Highway between Seikgyi area, Per Kler area, and Kyainseikgyi Town and patrolled every day because they received information that the Democratic Karen Buddhist Army [DKBA] Splinter Group Bo Kyaw Thet and Bo San Aung returned to District #6 [Dooplaya District]. BGF soldiers also patrolled in villagers’ plantations and beside the civilian road in eastern Taw Naw area in Noh Hpoe Htee Moo Hta village. Tatmadaw Military Operation Command [MOC] #8 and Light Infantry Battalion [LIB] #230 and #231 started replacing MOC #19 in June 2017 and they patrolled in the area between Kaw T’Ree and Law Pa, eastern Kaw T’Ree Township. LIB # 586 was led by Major Myo Min and Battalion Deputy Commander Shway Mo. Kyeik Tatmadaw camp commander is Battalion Deputy Commander from LIB #402. Consequently, military activities increased in Kaw T’Ree Township. The Tatmadaw described above operated in Kaw T’Ree Township in the area between Kaw T’Ree, Kyeik Don, and Per Kler and they are also rotated their troops from Kyeik Don to Kaw T’Ree and Kyeik Don to Kyainseikgyi between May and July of 2017. The military [Tatmadaw and BGF] were not threatening villagers or committing forced labour, but they patrolled [along the vehicle road or in villagers’ plantations] and questioned civilians about [DKBA Splinter Group] Bo Kyaw Thet and Bo San Aung. Nevertheless, they [Tatmadaw and BGF] did not commit any abuses even when the villagers told them that villagers did not know anything about [DKBA Splinter Group] Bo Kyaw Thet and Bo San Aung. During the period between May, June and July 2017, military activity in Kho Ther Pler and Kyainseikgyi areas decreased. The plantation owners are Naw V---, Saw W---, Saw X---, Naw Y--- and Saw Z---. Their plantations are located close to the Tatmadaw camp and when the Tatmadaw collected their durians, they assembled in L---’s house and reported this issue to the [U---] village head. After this, the village head reported this case to the Tatmadaw commander and told him not to allow his soldiers to collect durians from the villagers’ plantations. Later, the Tatmadaw soldiers became drunk and collected villagers’ durians again. When they went to the villagers’ plantations this time, however, they not only collected durians, but they brought guns and knives with them in order to frighten villagers. Villagers felt even more insecure, so they reported their concerns to the village head again. As a result, the village head also felt unsafe due to the Tatmadaw’s actions, but as he is the village head and he is responsible [on behalf of] villagers, he reported this case to the Tatmadaw General Win Htun and Myo Thu. Plantation owners reported that, they still have some durians in the plantation that they need to collect, but the current situation was not secure so they did not know what risks they would face. Durian plantation owners reported the issue to the village head on July 17th one time, and on July 18th a second time, and then the village head reported the issue on July 19th 2017. I [KHRG researcher] met with the plantation owners on July 20th 2017: the Tatmadaw did not collect villagers’ durians [on this day], but villagers still have to wait and see the situation. Military activity in Kaw T’Ree Township increased, but military activity between Myawaddy and Maw Hkee village, Kruh Tun [Kyonedoe] Township and Waw Raw [Win Yay] Township has remained the same over the past three months. On June 25th 2017, Tatmadaw General Myo Htun Win and his soldiers from MOC #19 [cut down trees in order to make] charcoal and collected flowers from the trees in the civilians’ reserved forest in Waw Raw Township. Moreover, Tatmadaw LIB #283, under the control of Major Aung Shway Oo and Camp Commander Mya Lay, enlarged their army camp location into villagers’ land in Kyainseikgyi Township. These were the military activities that occurred during May, June and July 2017. Some schools in eastern Kaw T’Ree Township have good school buildings and enough teachers, but there are a low number of students. 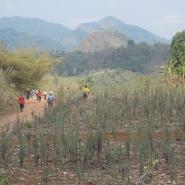 For example, Su K’Lee School in Su K’Lee village is a Burma/Myanmar government school that goes up to Standard Ten. There are 30 teachers but only 70 students because there are few households in Su K’Lee village. 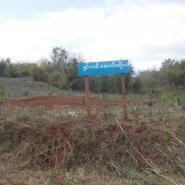 Anyhow, on the Su K’Lee village signboard it is written, “Su K’Lee Town” (Su K’Lee is a small village, but Burma/Myanmar government named it as a town). I [KHRG researcher] think this town will be the smallest town with the fewest households in Burma/Myanmar. Regarding education in Waw Raw Township, villagers face challenges because there is a shortage of teachers and a large number of students, particularly in Ah Plo village school. Thus, Saw M---, who spoke on behalf of the villagers, reported that they need more teachers and would like to request that the Karen National Union [KNU] and Burma/Myanmar government provide teachers for them in the coming year, 2018. School committees from other schools have also reported that their school buildings are small and students do not have access to enough school materials. Also, there are some students in Aww Hpa Gyi village tract who finished Standard Four from [Noh Poe] refugee camp and returned [to their villages, Aww Hpa Gyi village tract].They attempted to continue their studies at a Burma/Myanmar government school [as Standard Five]. Unfortunately, they were rejected [from attending Standard Five] so they have to repeat their Standards in Standard Two and Standard Three. Dooplaya District refugees in Noh Poe received information [informally] that humanitarian aid for refugees will be cut in 2019, so some refugees are looking for opportunities for their future. However, some refugees plan to wait and see the situation. Between May and June 2017, there were around 76 refugee households who went to their designated repatriation area in Lay Hpa Htaw area, Noh T’Kaw Township. In July 2017, there were around 144 Noh Poe refugee households that applied [for the United Nation (UN) repatriation] to return to Htee Nya Paw area where the [Noh Poe] camp committee had done assessments in the last week of March 2017 for repatriation. There are no houses ready in Htee Nya Paw area for refugees who will repatriate and this area is in the forest, so they [refugees] were concerned about whether they will receive support [humanitarian aid from the UN] or not. In regards to the area where refugees will return to in Htee Nya Paw [the authorities who monitor the repatriation process] need to ensure security and ensure houses, hospital, schools, and roads for returned refugees’ transportation are ready. If the refugees return before these things [security, school, hospital and roads] are ready, they will face major negative consequences. There are 40 refugee households who applied to return to their original villages between June and July 2017 and the number of refugees who are planning to return has increased because they received information [informally] that support for refugees will stop in 2019. The refugees have no other choice than repatriation: they cannot go further [resettle to a third country] and they cannot live in the camp without humanitarian aid so they have to decide to return. Refugees do not have any hope. Finally, they would like to request that authorities who have opportunities to share their information about their situation and talk about their concerns [to the UN] do so, in order for refugees to have access to humanitarian aid such as houses, schools, hospitals, security and roads for their repatriation so that they do not face future livelihood challenges. I [KHRG researcher] do not know how many refugees will apply for repatriation or if it will increase next month. We have to wait and see about the situation. On July 8th 2017, an [unnamed] organisation from Hpa-an Town met with villagers in T’Ku Hkee village, Noh T’Kaw Township and selected villagers who were struggling with their livelihoods. They asked questions about what kind of animal husbandry villagers who were selected would like to do. If the selected villagers wanted to breed cows, they would provide two cows [per family] and if the selected villagers wanted to breed pigs, they would provide two pigs [per family]. They listed the name of the selected villagers and what animals they wanted to breed, but villagers do not know the organisation’s name or when they will get any animals to breed. There is a water supply development project in K’Ma Kler village that is supported by [an unknown CBO/CSO] and the Burma/Myanmar government and the project will finish in August. The Border Consortium [TBC] also provided water pipes for water supply to the villagers in Hay Day T’Ku Hkee and Tay Lo Nee villages, Noh T’Kaw [Kyainseikgyi] Township. The TBC staff who organised the water supply projects were Burma/Myanmar teacher Tharamu Paw Tweh Wah and her colleague. The projects will be finished in August 2017. The Committee for Internally Displaced Karen People [CIDKP] also supported a water supply project in Kruh Tu [Kyonedoe] Township. They [CIDKP] started providing support for a water supply project to Th’Meh Do village in July 2017, but villagers do not know when the project will be accomplished. On June 26th 2017, an [unknown] company proposed to plant rubber plantations in the area between Ya Ther Ta River and Noh Ler River, but local villagers did not agree with the company’s proposal. If the company planted rubber plantations, villagers’ farms that they rely on for their livelihoods would be confiscated by the company. Additionally, villagers from three villages, Ya Ther Ta, T’Po Hpoe Hta and T’Nay Gay got together and reported this issue to [Ya Ther Ta village tract] administrator and then the village tract administrator reported it to the KNU Township authority to stop the company from implementing their project on July 10th 2017. Afterwards, there was no action from the company and villagers also did not receive any information [about the company] starting their project. Villagers still wait and see about the situation. These are all development projects that I [KHRG researcher] received information about. On January 16th 2016, this splinter faction established itself as the Democratic Karen Buddhist Army led by chief of staff General Saw Kyaw Thet and vice chief of staff General Saw Taing Shwe (aka Bo Bi) and commander Bo San Aung of company/unit Nar Ma Kyar (Deaf Ear). Therefore, confusingly, there are now two groups using the acronym DKBA being the main ‘Benevolent’ DKBA and the splinter faction ‘Buddhist’ DKBA. The ‘Benevolent’ DKBA has signed the Nationwide Ceasefire Agreement but the ‘Buddhist’ DKBA splinter faction has not. All conversion estimates for the kyat in this report are based on the January 29, 2019_official market rate of 1,320 kyats to US $1. For more information see, “US wraps up group resettlement for Myanmar refugees in Thailand,” UNHCR, January 2014.